"A federal judge in Massachusetts has struck down four key portions of a 2016 municipal ordinance in Newton, a Boston suburb that effectively banned drones. The lawsuit, which was filed in January 2017 by a local doctor, involves a question that has yet to be fully resolved in the age of increasingly pervasive and inexpensive drones: how much can localities restrict them? The Newton law, which was passed in December 2016, bans drone flights over private property at or below 400 feet without the property owner’s permission. The law also requires that all drones be registered with the city and that drones not overfly schools, city property, or sporting events without specific permission. In a Thursday court order, US District Judge William Young concluded that these particular parts of the law went too far." I'm for safety and privacy. But the laws need to be carefully written on how much restriction there can be on drones. 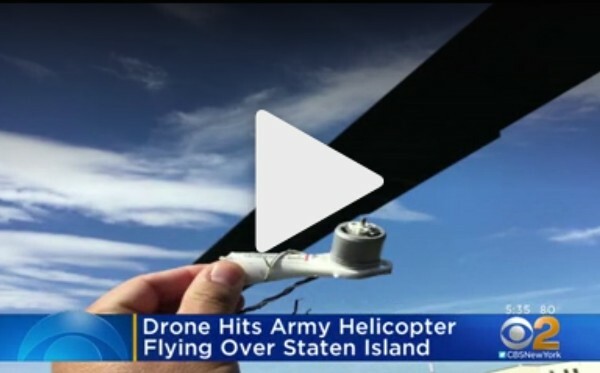 "The Army said the choppers were flying low along the east shore of Staten Island when a drone slammed into the side of one of them. Something to worry about. It's not sure if the copters were flying below 400 feet, or the quadcopter was above that limit. "The Seattle-based start-up, founded by twin brothers James and Joel Egan, says the drone can maneuver and move quickly like a fixed-wing aircraft, hover and vertically take off and land like a helicopter, and operate efficiently and safely like a blimp – all on a single platform. Furthermore, PLIMP can deliver forward speeds of more than 40 mph and at least an hour of flight time." "Just before noon on September 5 an aircraft approaching the Happy Valley-Goose Bay airport had a near-miss with an unmanned air vehicle, more commonly known as a drone. RCMP said the incident happened in the area of Wilburn Bay and are asking anyone with any information to contact the Happy Valley-Goose Bay RCMP at 709-896-3383. Transport Canada brought in regulations for drones early in 2017, to mixed reviews from the public. One of those rules is that you can no longer fly within nine kilometres of an aerodrome — anywhere an aircraft takes off or lands. The regulations also preclude recreational pilots from flying drones weighing more than 250 grams higher than 300 feet; within 250 feet of buildings, vehicles, vessels, animals or people; more than half a kilometre from the user; at night, in cloudy conditions, or outside the visual line of sight; without a name, address and phone number affixed to the drone; and over forest fires, emergency response scenes or controlled airspace. Breaking the rules can have a fine up to $3,000 for recreational users and up to $15,000 for corporations." So there's the rules for Canada. It will probably be impossible to catch the idiot this time though. "Founded in 2017, SkySkopes Academy’s goal is to deliver the most critical knowledge of unmanned flight systems in an effective and engaging manner. Safety is a top priority for our staff at SkySkopes, a national leader in unmanned flight operations, and we wanted to share our knowledge with others interested in unmanned aircraft systems. We created SkySkopes Academy as a means of providing extensive education and training opportunities to students looking to take their UAS experience to the next level. Our academy brings together UAS experts from across the industry to provide a comprehensive curriculum that teaches our students to safely and knowledgeably fly their aircraft in the national airspace. The courses are based on our internal training procedures for our staff and are designed to be interactive to encourage a better learning experience for students. SkySkopes Academy is headquartered in Grand Forks, ND, which is considered a hub for unmanned aircraft innovation and development. " A good and useful idea. I might just go there. "MOSCOW, September 4 (RAPSI, Yelizaveta Ponomareva) – Officers of the Federal Penitentiary Service in the Stavropol region of Russia have arrested a man who attempted to transport objects banned for inmates of a local prison using a quadcopter, the Service’s press service informs on Monday. The quadcopter was loaded with cellular phones, battery chargers, and various mobile phone paraphernalia, according to the statement. The offence could be stopped due to the guards’ vigilance, who spotted the quadcopter." So apparently they didn't shoot the drone down or anything? Just somehow grabbed it and the pilot? Good work! drones for emergency responders; working well! Drones used during floods, for fire departments, search and rescue, etc. Just make sure the idiots aren't out there flying around when they're not supposed to be. "Tanzania has become the latest country to partner with Zipline as it has launched the world’s largest drone delivery service. The service will provide emergency on-demand access to critical and life-saving medicines. This comes after Rwanda kicked-off its medical supplies delivery service by Zipline drones in October 2016. Subsequently, in January 2017, Tanzania announced that it will be partnering with Zipline to trial drone medicine deliveries."